I was born, as I say, in 1921, but it was not until the early 1930s, when I was about ten, that I bean to understand what a peculiarly frustrated and disinherited world was about me. Perhaps my approach to realization was through the crayon portrait of Granpa Hodgins which hung, very solemnly, over the mantel. Granpa Hodgins, after whom I was named, perhaps a little grandiloquently, Hodgins McCormick Backmaker, had been a veteran of the War of Southron Independence. Like so many young men he had put on a shapeless blue uniform in response to the call of the ill-advised and headstrong - or martyred - Mr. Lincoln. Depending on which of my lives' viewpoints you take. With the possible exception of World War II, the largest number of alt-histories centered around the events and personages of the American Civil War. What if Lincoln had not been as "headstrong," as many of his detractors had noted? What if Maryland and Missouri had voted to secede in 1861, cutting off Washington, D.C. and most of the Mississippi River from Union control at the war's outset? What if Buell had not arrived in time at Pittsburg Landing? What if "Stonewall" Jackson had not been shot? What if Lee's general orders had not been rolled up in tobacco and dropped, only to be discovered by Union forces before Antietam? What if the Confederate forces had occupied the Round Tops at the onset of the crucial Battle of Gettysburg? These are the sorts of questions that have haunted historians as well as citizens on both sides of the conflict. Although, as I said in my earlier review of Keith Roberts' Pavane, I have a professional wariness of alt-histories, sometimes these works, if they revolve around more than just a single person or event, can add something to our understanding of the historical event or era in question. Ward Moore's 1953 novel, Bring the Jubilee, deserves to be placed in this categorization of rewarding alt-histories. Its combination of events, trends, and awareness of social dynamics raises it above the level of a mere "what if?" hypothesis, as there are some disturbing elements explored in this work that certainly apply to American society of Ward's time and perhaps for our own as well. Bring the Jubilee is written in a first-person, pseudo-autobiographical format. The narrator, the young Hodgins M. Backmaker, born in 1921, narrates life in the defeated Union almost a century after its defeat at the hands of the Confederacy. As a native Southerner who grew up hearing tales of the "Lost Cause," Moore's transference of the mixture of guilt, anger, and emotional depression from the gutted South to an imagined defeated North rings true. From the KKK analogue, the Grand Army, to the widespread, deep economic recession that wipes out all of the early proto-industrial developments in the North during the antebellum period, the Civil War, now known as the War of Southron Independence rather than the War of Failed Southern Independence, has come to hold the same level of bitter significance for the Yankees as the Civil War has had in the South in reality. Moore also does a very good job extrapolating from the conditions he alters. 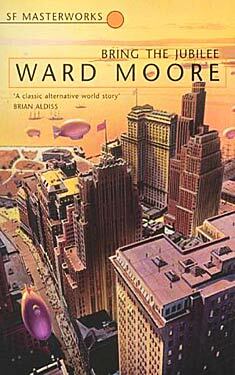 From the horrid treatment of African Americans in the Union (comparisons are made in a few places in the text to the Jewish Pogroms of the early 20th century) to the anti-immigration initiatives to the Confederate conquest of Mexico in the late 1860s, these events feel all the more "real" because of how well Moore hints at the root social causes: scapegoats for the defeat, the need to appease the stronger powers around the shrunken Union, to the desire of the Confederacy to expand in order to preserve its polity and power. As strong as Moore's social historical extrapolations might be, some readers may find his narrator to be almost too invisible in the background. Backmaker, as a historian, serves the narrative point of detailing the alt-history that has unfolded. He is a witness, not an active participant, for most of the novel. This narrative "invisibility," while it serves to accentuate Moore's imagining of how events could have unfolded differently, does make it more difficult later on in the novel when Backmaker becomes involved in a physics experiment in the 1950s that ends up with him playing a much more decisive role in the "Jubilee" than what had transpired for the first 80% or so of the novel. This shift in the narrator's importance to the overall story was a bit abrupt, but yet it does circle back to a part of the introductory chapter that I chose not to quote. Bring the Jubilee's strengths far outweigh its negatives. Far from being a simple "what if?" alt-history, it is a well-considered, well-constructed argument for how social attitudes could change in the light of military defeat. His defeated United States feels very plausible and the related world events around this time fit comfortably with Moore's takes on people, their fears, their desires not to rock the socio-political boat, and so forth. Although the final two chapters may feel awkward in comparison to the first, Bring the Jubilee certainly is one of the finest alt-histories that I have read, one that is well suited to the "masterworks" label attached to its Gollancz edition.